nothing feels more wabi-sabi than hosting. when we invite guests into our homespace, we are exposing our imperfections – the chipped dinnerware and mismatched chairs, the stained tablecloth and dirty dishes. and yet, this is exactly what we celebrate. the vulnerability. the comfort. the togetherness. hosting guests at the dinner table may very well be my love language. there’s something about creating an ambience where, when guests arrive, they feel at peace. candles lit, music playing in the background, wine glasses filled. my only wish for them is that they can let go, be present, and leave with a sense of wholeness. i’ve learned through living in a tiny space that hosting guests is not limited by square footage. on chilly nights, the table comes inside. when weather permits, the table goes outside. the point is that we are together, eating and drinking and laughing, sometimes crying. i wish i could say that when we host people for dinner, i could whip up whatever-have-you and just sit at a bare table, making for an easy prep and clean-up. but that wouldn’t be true to me. i love through food. i express my care through setting a table. i find peace in the prep, likening it to a soulful journey that ends with a humble meal among friends. 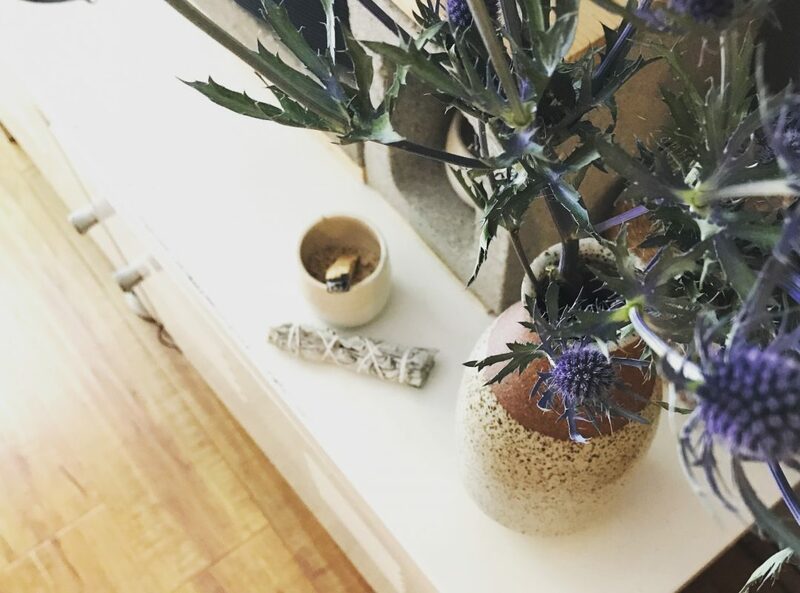 i host with intention, and hope that by doing so, i am offering a sense of reprieve – that when you enter into this space, however imperfect, you are being taken care of. …one glass of wine at at time. today is our four-year wedding anniversary. i remember the day so vividly – the crispness of that early fall morning we shared; the way the october sun illuminated our ceremony, nestled in the cliffs; how my heart beat when i laid eyes on him, my hands in his; our first moments spent as husband and wife, the vastness of the ocean before us, a harbinger of a bountiful life to come. it goes without saying that this day evokes a host of emotions for me. it was magic and love, and had a pulse of its own. it was ethereal, really. …and that’s exactly how i will ever know it. because it was us. the light shifts, softening as the day progresses, warming as evening sets. stews and braises, pasta and baked goods. a bounty of gourds, every which shape. socks, to be worn without abandon. to warm the spirit, chai and cinnamon, ginger and nutmeg. robust reds and smooth whiskeys. knits and layers. cozy in, cozy out. celebrating the greatest commitment i made to be a wife and life partner. shorter days, longer nights, more rest, and endless cuddling. deep love, quite possibly of the deepest variety. soul-filled kind of love. it’s something i want to carry with me as we transition into fall, a gratitude for everything this precious life is. yesterday was the equinox, marking the beginning of a deep shift. when outward energy is focused inward. when time is intentionally set aside to stay in, wind down, and connect. it’s approaching every new day a little slower, a little more centered, doing the ordinary and seeing the extraordinary. i have yet to know what my legacy will be or how it will look, but i welcome this season to just be. to settle in and praise this day for what it is – all imperfect and wildly uncertain. here’s to autumn. “in traditional Chinese Medicine, there are five seasons instead of four, the fifth of which begins mid-august and concludes with the autumn equinox. this fifth season is associated with the element of earth and represents an ideal time to slow down so that we can mindfully transition from the expansive energy of summer to the introspective quality of fall and winter. i don’t think i’ve ever paid attention to this particular time, the eagerness for the autumn equinox always looming large. however, this fifth season is so unique in and of itself, it should be celebrated. i’m grateful for a few leisure days spent with girlfriends in mammoth, where we practiced the art of settling in, fully embracing what these days have to offer. going on hikes and cooking at home, working on puzzles and chatting by the fire, we were immersed in the fifth season without really identifying it. and so it goes, what a gentle reminder to slow down and ease into what’s to come, just as the earth is already doing, just as nature always intended. beauty is born from patience, that i am sure of. three months after making the decision to reduce my percentage at work, i have never felt better. more time to rest, more energy to build relationships, more freedom to explore my interests and dive deeper into my sense of self. yes, i’m making a financial sacrifice, but what i gain in life is priceless. surprisingly, it was not an easy decision – to work less and live more. it’s been engrained within the fabric of our society that while we are young, we work! save! BUY! we then have children and continue the quest for working! saving! BUYING! in so doing, little to no time is made for responding to our inherent desires, those things that complete the wholeness of being. it’s not until we believe that it’s alright to steer from expectations that we can live the life we’ve only dreamed about. somewhere, packed in the depths of my persona, is a florist. in that dream life of mine, i own a flower shop where i’m surrounded by wild varieties, making arrangements and evolving creatively with the passing of time. it would be my heart’s desire, manifested. far from owning a shop, i am now interning at one. one day, i walked into Fiore and asked the shop owner if there were opportunities for someone like myself – with no formal floral experience, just a passion for them – to be involved in any capacity. two weeks later, she offered me a chance to intern. a few days into it, and i am overwhelmed with gratitude. at Fiore, i learn and feel inspired. i am surrounded by women with a passion for florals and beauty and nature’s abundance. i am removed from the impulse to work, save, buy, and i’m instead fulfilling a dream that can only be lived by letting go of self-imposed expectations. ultimately, i am honoring the desires of my heart, celebrating its ability to strengthen a passion that has always existed within. for these reasons alone, in this season in my life, i am open to wherever this leads. …because in the end, i’ll be better for it.